Chaitra Navaratri is going on and during this period, rice and wheat are generally avoided. Little millet/Samai is considered as a fasting grain. This is the right time to share this recipe, which is easy to prepare and tasty. Dry roast millet for 2 minutes on low heat. Remove, wash thoroughly and dry on a clean cotton cloth for 20 minutes. Make grits/rava using the small mixie jar. In a bowl, add curd and salt and beat to make it smooth. Mix the millet grits thoroughly and keep it covered to ferment overnight. Next morning, add chopped green chillies, grated ginger and soda. Mix well. Grease two small plates and pour the batter in them. Tap the plates so that the batter spreads evenly. Steam the batter for around 10 to 12 minutes. Once cooled, cut into pieces. 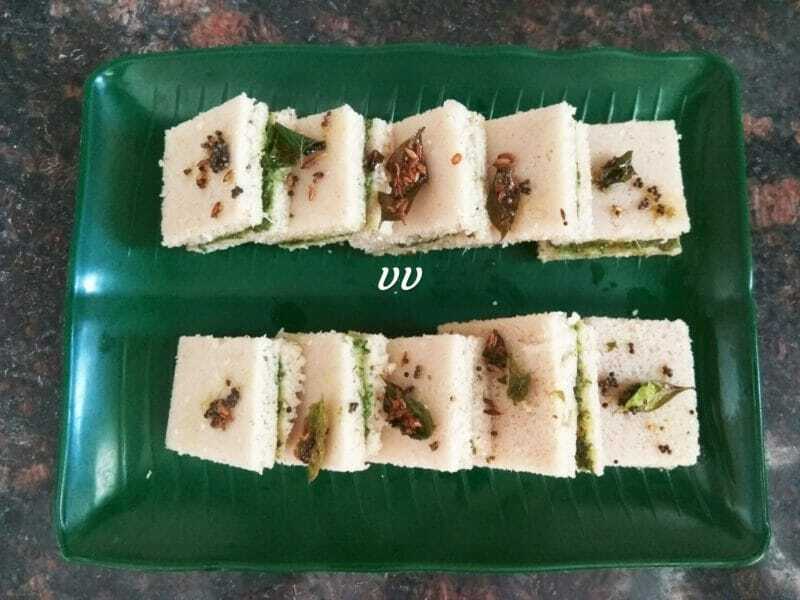 Take a piece of dhokla, apply green chutney and cover with another piece. Repeat the same for the remaining dhoklas. Do the seasoning mentioned above and pour it on the dhoklas. Serve. 1. Green Chillies are optional and can be skipped. 2. Make sure that the batter is thick and not runny. Adjust curd accordingly. If the batter is too thick, add a few teaspoons of water before steaming. Can you please suggest some alternative for Curd? My husband and I don’t like curd but I would love to try this recipe. Please also share the recipe for green chutney. If you are not comfortable with dairy curd, use non-dairy curd such as peanut curd. It needs some souring agent for fermenting. Or soak overnight in water and add eno, just before steaming. It might work. Hi mam, beautiful presentation and thanks for sharing d receipe.. Would like to know if it’s possible to skip soda in this..?? Is there any alternative..
You can skip the soda completely. It gives softness to the dhoklas. Instead, you can add a tbsp of Poha while soaking.